A long time ago, on a Sabbath day, a man blind from birth stumbles, shackled in a prison of darkness. Jesus of Nazareth finds him, spits on the ground, creates mud and puts it on his eyes. “Go”, Christ says, “wash in the Pool of Siloam”. The blind man followed Christ’s instructions and on his way home something wonderful happened. No longer did he stumble, but now he was sure of his footsteps, in total awe and wonder at the colors of the world around him. For the very first time he can see the blue sky, the golden light of the sun, the faces of his parents, his very own face. His neighbors are perplexed, unsure if he is the same man who was blind from birth. He boldly acknowledges, “I am the man”. The neighbors brought him to the rulers of the synagogue, who immediately judged that whoever healed the blind man on the Sabbath was a sinner. For many at that time, to be thrown out of the synagogue would have meant a lifetime of tragedy and shame. Not this man. Acceptance into religious and social circles was no longer important to him. For years since birth he had been an invalid, but now, with the gift of sight, he has come to gain an inner power, a new perspective, a reversal of values. A new life. 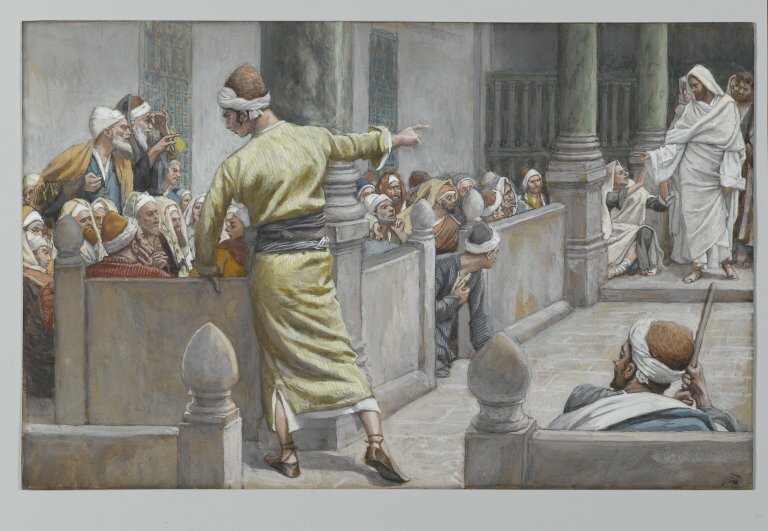 Image Credit: Wikimedia Commons, “The Healed Blind Man Tells His Story to the Jews” by James Tissot (1836-1902). This is a faithful photographic reproduction of a two-dimensional, public domain work of art. This work is in the public domain in the United States, and those countries with a copyright term of life of the author plus 100 years or less. 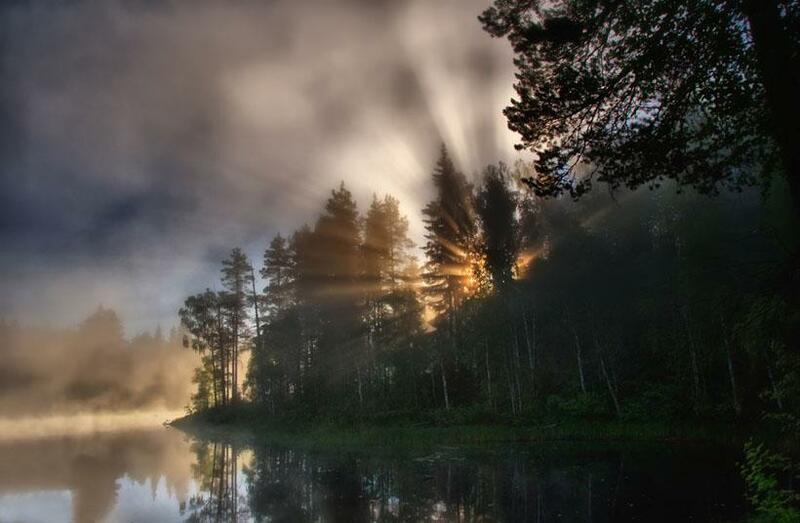 There are times in life when a person, though mentally fit, experiences a nameless unhappiness in the soul. It is the same condition reflected in the Psalmist’s lament, “Why are you cast down, O my soul, and why are you in turmoil within me?” 1 This affliction touches many, including Christians, and it is a state that leads to spiritual depression. One of the causes of spiritual depression is fear of the future. This was a peculiar problem of one young man in the New Testament named Timothy. He was dependent on the Apostle Paul, and fears arose with the impending perils that his mentor was facing. Alongside was a fear of failure in the seemingly daunting tasks that lay ahead of him while Paul was in prison. Paul reprimands Timothy for being gripped by the spirit of fear: a spirit which does not come from God. If we suffer from this manifestation of spiritual depression, it is due to our inability as Christians to realize what God has given us and is giving us — the gift of the Holy Spirit. It is being negligent to stir up ourselves, to think, to take ourselves in hand. Next, Paul mentions the spirit of love. One of the root causes of the problem is that fearful people are too involved in self. The way to rid of self is to be so absorbed in someone or something else, leaving no room for thinking about oneself. The spirit of love. Lastly, God has given us the spirit of a sound mind. In spite of our natural weaknesses, God has given us, for us to appropriate, the spirit of self-control, discipline and judgment. As Christians, we do not live on and by ourselves. Through God’s marvelous work of salvation, He has implanted within us a principle of a divine spiritual life through Jesus Christ. We need to “stir up the gift”, reminding ourselves of who we are in Christ. And casting fear aside, let us move steadily forward in life, giving glory to the One Who gave His all for us. in teaspoons of the leaven for the bread. awaken ‘midst the dewdrops on the grass. I walk beneath the shadow of Thy wings. the times, I know, my times are in Thy Hand. await the feeble warmth of winter morning. the mountain goats climb to their high places. O Source of Strength and Joy.